Dying Earth is a fantasy RPG based on the works of Jack Vance. Bill ran a game using the rules from the Revivification Folio. A group of travelers finds themselves trapped in a magical hotel, possibly forever, unless they can find a way out of a wizard’s contract that binds them there. Witty banter, intrigue, and skulduggery are to follow! 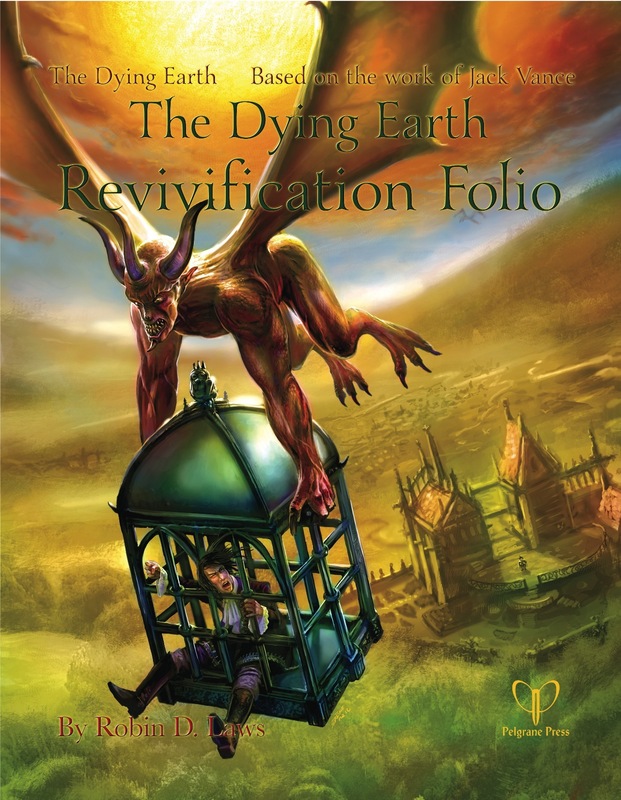 The Revivification Folio rules get players started within minutes. They set aside the extended, decision-heavy character generation of the original version for a system based on the random distribution of cards, which together take the place of a conventional character sheet. Players step more readily outside their established comfort zones when you can get them playing right away. When they spend less time creating their characters, they’re more open to seeing them meet the ironic comeuppances the game so often demands. I said this on the Patreon: is it just me or did tom disappear for a while in the middle of the game? I found this game interesting, though I’m not convinced that anyone I know would enjoy it. I felt like there might have been some tension between actual players at time, but I can’t recall examples. seemed like you guys were keen though. You guys mentioned it briefly; but how did you generate the list of “lines” or “quotes” that everyone was using? Are the cards mentioned part of the folio or were they created specifically for this game? I have no doubt that my wife and brothers would love this game. I must acquire it. I think Bill printed the cards out from the PDF of the Folio. Bill had printed out lines as well. I demand illustrations of these characters. THE CODPIECE MUST GRACE US ALL! Games where Ross gets drunk on conflict and shenanigans are the best games. Also this does seem like a good system to look up. Shanghai was one of our favorite chapters to play. We miss playing with the RPPR crew. what seemed to be a mix of the GM, the rulebook and the setting made this game extremely… verbose, I guess. and I loved every pretentious minute. Great game. Well played by all. Unique setting and credit to Bill for keeping up the purple prose patter.